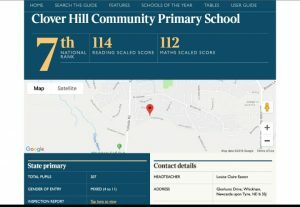 Clover Hill ranked 7th best school nationally!! We pride ourselves at Clover Hill on having a broad and balanced curriculum, on helping each and every child reach their full potential in all aspects of school life and also on preparing our children for their future life in modern Britain. However, last week The Times newspaper published this year’s Top 500 Primary Schools (based upon SAT results of 2017) and we were delighted to find that we have been ranked 7th out of 500 schools!!!!! We are so proud of our children – not just for great test results- but for their attitude to learning, their commitment and their determination to succeed. Our children receive an amazing all round education and leave Clover Hill happy and confident young people ready for the next stage in their education. That counts for so much in our eyes.